My female reader of a certain age may recall the scene in the film, Robin Hood: Prince of Thieves (1991), in which Kevin Costner in the title role bathes naked under a waterfall. He is surprised by the fragrant Maid Marion, played by Mary Elizabeth Mastrantonio, and the rest is inevitable. With all due respect to Mr Costner, who I generally consider to be a fine actor (JFK is an excellent movie), for some reason that particular scene has not seared itself onto my memory – though I can remember a bit from Basic Instinct if I try really hard. 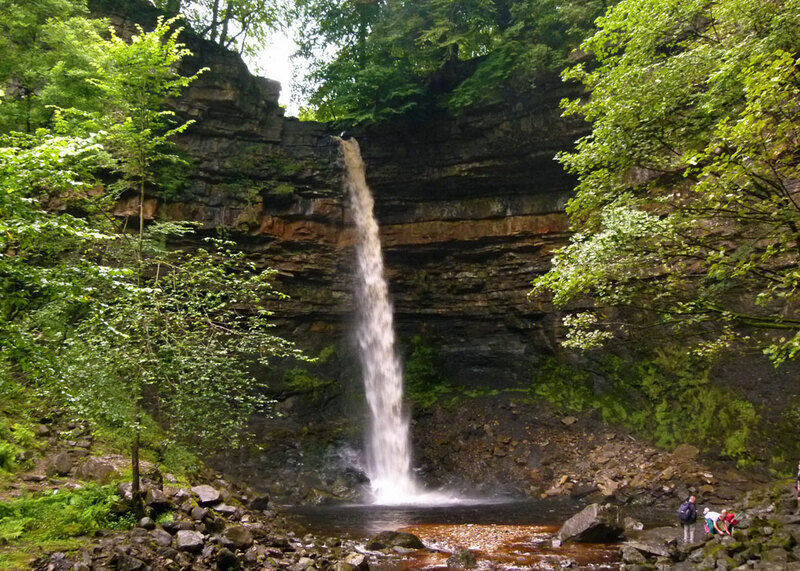 Moving on, the point is that the Robin Hood scene was apparently filmed at Hardraw Force, which claims to be the highest unbroken waterfall above ground in England, with a drop of 98 feet (30 metres). 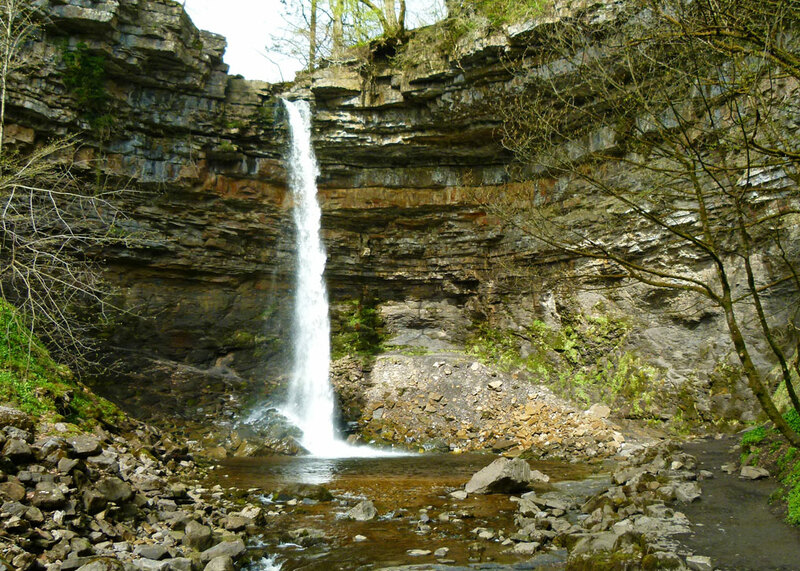 The ‘above ground’ qualification is important, because there are underground waterfalls with longer drops; for example, Fell Beck falls some 315 feet (96 metres) down Gaping Gill on the side of Ingleborough. Do not expect to see a Niagara, but Hardraw is worth a visit if you’re in the area. Plus, the experience is relatively painless, and a bit different. You can walk to Hardraw village – it can be included in several local walks and is also quite close to the Pennine Way – but you can’t actually get to Hardraw Force safely without passing through the Green Dragon pub and paying a small fee – £2 each last time I went. Now, the pub is one of those where I instinctively want to squander several hours with some beer and good company. 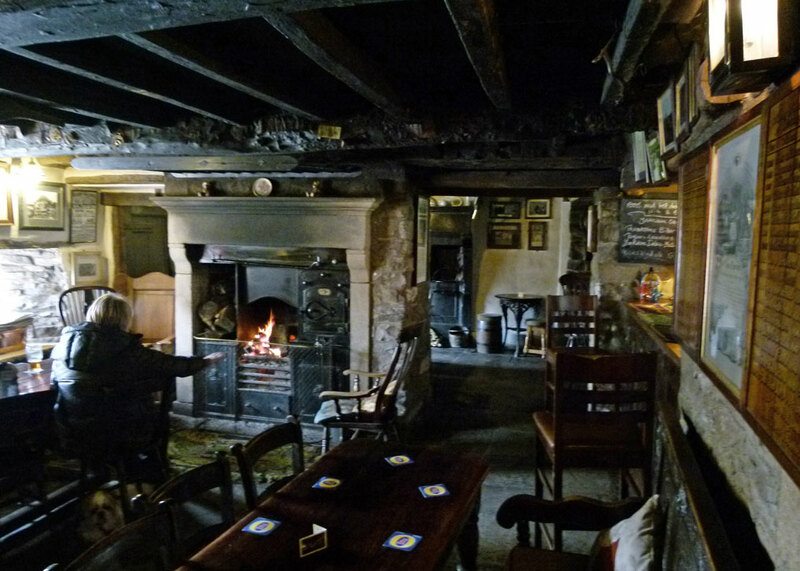 It is old, dark, with lots of different rooms and non-mass-produced furnishings, and has managed to escape the dreadful thrust of ‘themed pubs’ – God save us! But to spend that kind of time, of course, you need to leave your car somewhere else – Hawes, perhaps, or maybe Leeds – and I’ve always been driving. 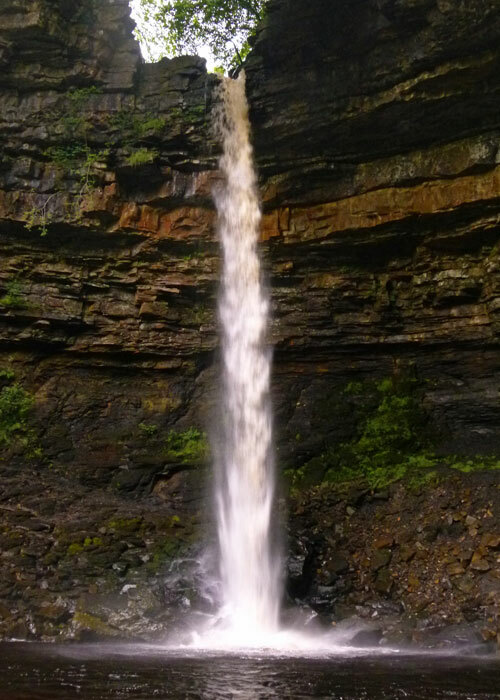 Whatever – you will need stout footwear for the short walk to Hardraw Force from t’ pub. The path is good, but can be muddy – and slippery, as you’d expect. You’ll hear the waterfall before you see it – past a campsite and bandstand, round a corner through a wood – and there it is, in a kind of natural amphitheatre, the exposed layers of rock different colours. The flow obviously varies according to recent rainfall, from a thundering torrent to a slightly worrying and embarrassing trickle. It has been, so they say, visited by other famous people in addition to me and Mr Costner. It seems that the poet Wordsworth and his sister, Dorothy, and the artist J MW Turner, all stayed in the “Green Dragon” (though not simultaneously). They evidently felt the same way about the pub as I do. The name ‘Hardraw’ is said to be derived from the old English for ‘shepherd’s hut’ and ‘Force’ is the same as the Norse word foss, meaning ‘waterfall’. You’ll find the pub in the village of Hardraw on a minor road a little north of Hawes, in Yorkshire’s celebrated Wensleydale. Rumour has it they hold musical events there too – including brass band competitions. What more could you ask? Kevin might have suggested brass monkeys. To round off, from the big screen to the small, the church of St Mary and St John in Hardraw doubled as Darrowby church in the TV series All Creatures Great and Small. 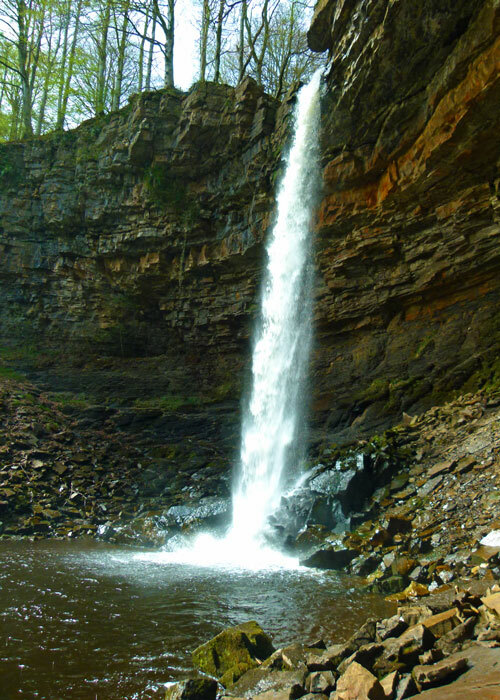 Check out Hardraw Force and other places nearby in the Attraction Directory. I must be of a certain *different* age, because I never saw that film. The only Robin Hood I have ever seen was Errol Flynn – love that movie!! But Glenn Hogg’s comment above reminds me I’ve always wanted to see “Robin and Marian”. Had to look that one up on the map, but I was approximately right. Geology of that falls looks very interesting. As Robin Hood he ranks near the bottom. I do like waterfalls … and thanks to Magali for the youtube link … I haven’t used it – yet! LOL! They must have been really fascinating papers, Magali..! A place I’ve always wanted to visit just to see it but I’ve usually picked caving in England instead as they have the best limestone caverns for walking through. K. C seems to suit the old west and cowboys really well- Dances with Wolves, Open Range, Wyatt Earp were all pretty good films. I did see the film but have never found Mr Costner particularly attractive, and was completely unfazed by his naked body. Nonetheless, Hardraw Force is yet another place to put on my list for this year’s (or next) Yorkshire holiday, if any of our relatives will be so kind as to drive there with us. What puzzles me is that you pass a campsite and band stand AFTER you have gone through the pub and paid to see Hardraw Force. Are those staying at the campsite or visiting the band stand also required to pay? Mr C isn’t my type, either, Meike. Good question – I suspect if you pay for the campsite or a music event, they include a look at the falls. I loved the film and the music and did not realise that The Waterfall was even in the UK. My geographical gripe with the film was that they ‘landed’ on the south coast and appeared to get to Nottingham way by the afternoon! An interesting post, as always! I think “Robin and Marion” the best of them. Isn’t a fabulous sight! I do love a good waterfall. Have you seen Aria Force in the lake district, that is a good one – I think! I do love a good waterfall and hearing the force of the drop before my eyes set upon it. The Green Dragon sounds just up my street with its dark beams and inviting atmosphere! Perfect stop to recharge the beer taste buds before embarking on the trek!! Mr Costner’s version of Robin Hood was brilliant though not through him, rather Mr Rickman’s fantastic lines and acting … “I’m going to cut your heart out with a spoon”… “call off Christmas”…!! Saw the movie, what an atrocious accent he had, sort of remember the scene. The Green Dragon sounds like a place I’d like to spend some time in. I remember my husband (before he became my husband) borrowing the video (those were the days) and bringing it and a couple of bottles of wine round to my house one evening. I remember the start of the film but somehow or other I can’t remember whether we watched to the end or what happened. I don’t remember KC in the buff at all! Hardraw Force looks like the kind of place that I *would* remember! My husband would definitely appreciate the ‘Green Dragon’. It’s quite a pretty waterfall! Of the two Robin Hood movies that came out that year, I actually prefer the Patrick Bergin and Uma Thurman one. Gracious I remember going there many years ago and the pub hasn’t changed at all.